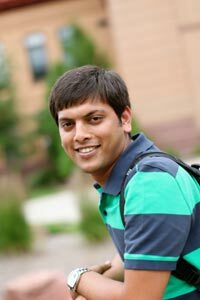 Ankush Agrawal, NDSU Transportation and Logistics PhD student, will present a research paper at the 2013 International Conference on Construction and Real Estate Management (ICCREM 2013) Oct. 10-11 in Karlsruhe, Germany. He was recently notified that his paper, "Developing Evaluation Tools for Achieving a Sustainable Concrete Design and Construction," was accepted for presentation and will also appear in the conference proceedings. The paper points out sustainable tools and methods that can be applied to the construction industry around the world, thus making the construction industry greener and reducing its carbon footprint. NDSU is one of the universities and organizations organizing the conference. The event helps researchers, practitioners, and educators in the construction and real estate industries exchange ideas, build networks, and share knowledge.